Slower growth in China and continuing stock market uncertainty pose a threat to global economic growth, the International Monetary Fund has warned. 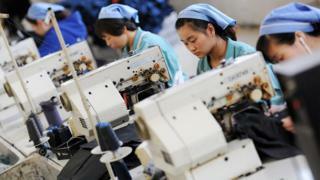 China's slowdown appears to have bigger repercussions for other countries than had been expected, the IMF said. The troubles in China have sent the prices of commodities such as oil and copper sliding. The IMF's warning comes ahead of a meeting of G20 finance ministers and central bankers in Ankara on Friday and Saturday. The IMF said that the problems could lead to "much weaker outlook" for global growth. However, US Treasury Secretary Jacob Lew warned China against manipulating its currency to give its exporters an unfair advantage. "We are going to hold them accountable," he told CNBC. The Fed, which could decide to lift rates when it meets on 16 and 17 September, should keep its decisions "data-dependent", the Fund said. Analysts at Societe Generale said: "The IMF clearly doesn't think raising rates against the modest global growth backdrop is a good idea." More broadly the IMF recommended that advanced nations should maintain very loose monetary policies and "growth-friendly" fiscal policies.